Ralph Jones has been the prime organizer of the Proud American Reunions and he continues his excellent job with all of our activities. If you have any thoughts or questions on this or future reunions, please communicate them to Ralph. If you didn't come to the previous reunions click below to see the Proud Americans who attended. There is one more reunion I'm working on and that is returning the Zippo lighter pictured below to its original owner or his family. 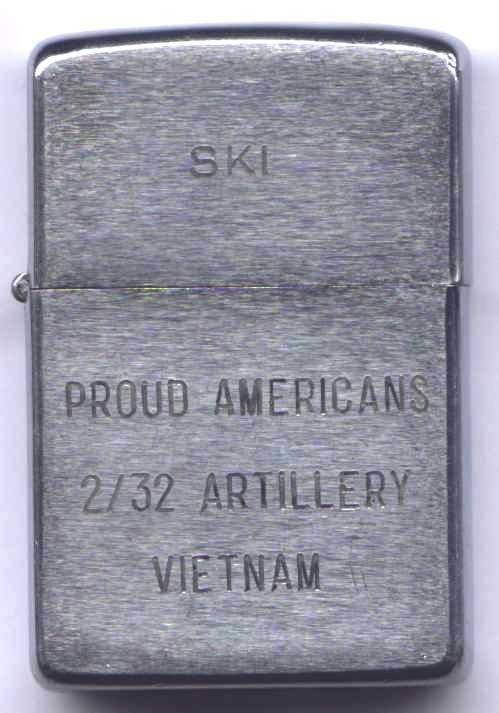 The lighter is engraved "SKI" Proud Americans 2/32 Artillery Vietnam 1968. If you can help with this reunion send Chuck Healey the information. This lighter was found recently by Captain Gerster of the Swiss Army Artillery. Captain Gerster collects Zippo lighters, particularly those of the Vietnam era. If you have any ideas who "SKI" could be, let me know. Captain Gerster is a frequent visitor to the Proud American Web site.